There’s a vast network of tunnels underneath Chicago that once handled coal and ashes for dozens of buildings connected at their sub basement levels. The tunnels were in operation from 1904 to 1959, and then forgotten about until a catastrophic flood reminded everyone they were there. 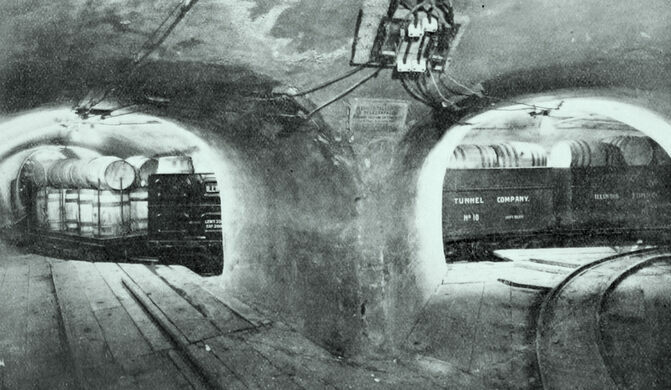 Work began on the tunnels in 1899 under the auspices the Illinois Telephone and Telegraph Company, reorganized in later years as the Chicago Tunnel Company. An enormous quantity of blue clay soil was excavated by hand and used as landfill to build up low lying areas on the waterfront. The Chicago Tunnel Company had an aggressive (perhaps brash) business strategy, building 60 miles of tunnels before securing a single client. Once the network was complete they approached downtown buildings and offered an array of services, including telephone and telegraph connections, and coal, mail and merchandise deliveries. And the clients did come; tunnel connections were built to the Board of Trade, City Hall, Merchandise Mart, the Federal Reserve Bank, the Chicago Tribune, the Civic Opera House, the Field Museum, and dozens of others. One of the Chicago Tunnel Company’s more inventive products was “tunnel air” (55˚F year round), which they piped into theaters and hotels as natural air conditioning. 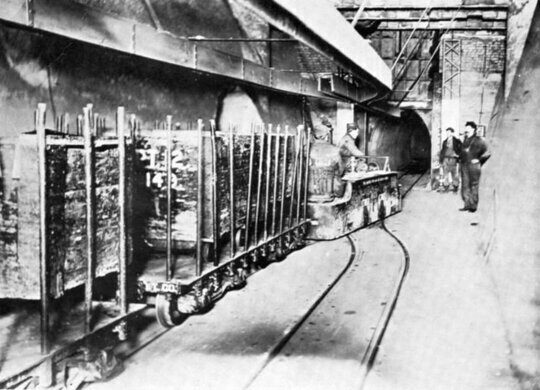 For decades, little electric trains used the tunnels to make their deliveries free from the congestion of surface traffic. 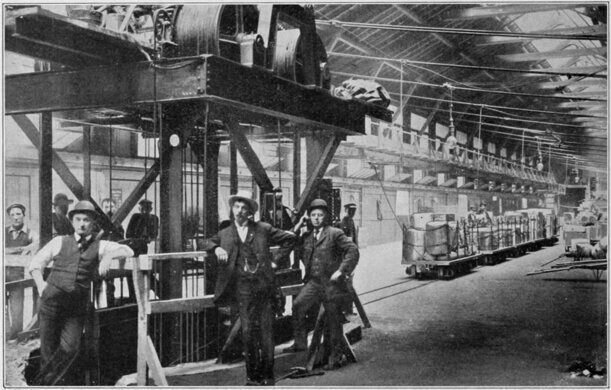 Operators navigated using street names painted onto the walls, and avoided collisions using nothing more than a “sight and sound system,” in the generous words of Electric Railway Journal. The tunnels saw their peak usage in the 1940s and 1950s but struggled financially because of tremendous capital investments and increased competition from the trucking industry. In 1959 the Chicago Tunnel Company went out of business and sold their fleet of little trains for $64,000 in scrap. Of course, the tunnels didn’t just go away after that. As memory of this unique bit of infrastructure faded into obscurity the city allowed a few special businesses to continue to use them. The Chicago Tribune, for example, used the tunnels until 1981 to transport newsprint from their paper warehouse to Tribune Tower. 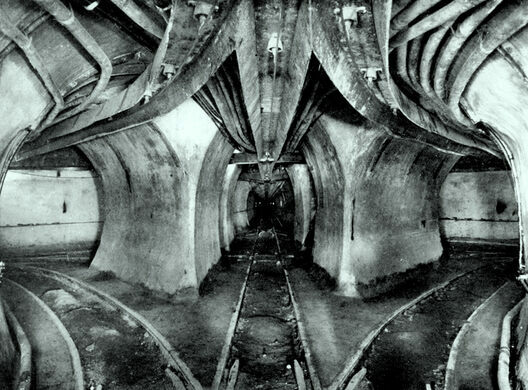 On April 13, 1992 the tunnels jumped back into the headlines in what the press dubbed “The Great Chicago Flood.” Employees of the Great Lakes Dredge and Dock Company driving new river pilings near Kinzie and Canal Street inadvertently punctured a tunnel roof, allowing millions of gallons of water to gush into the network. All the old buildings that had connected to the tunnels decades earlier were flooded, electricity shorted, and records at City Hall were soaked. The incident ended up costing roughly $2 billion in damage. Since then the tunnels have been sealed, and entry is near impossible.